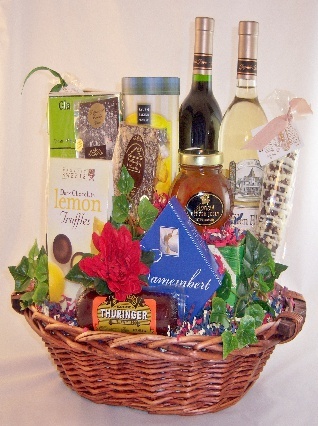 Here is a wonderful gift to thank a client or buisness associate. Guaranteed to get repeat buisness. Includes 1 bottle of wine, red or white, cheese, crackers, sausage, gourmet popcorn, chocolates, nuts, cookies,and a jar of pepper jelly. Add a second bottle for $12 more.